NEW YORK (AP) — For the past two months, the rest of the NFL has tried to slow down Drew Brees and the New Orleans Saints. And no one has been able to figure out how. 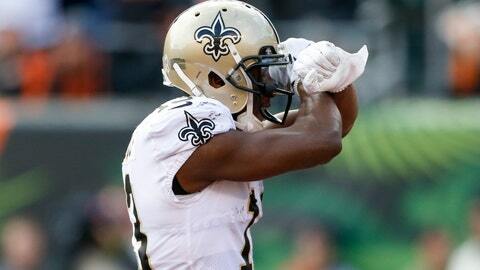 The Saints (8-1) rolled to their eighth consecutive victory with a 51-14 pummeling of the Cincinnati Bengals on Sunday. The Saints kept the No. 1 spot in the latest AP Pro32 poll . They received 10 of 12 first-place votes and 382 points in balloting Tuesday by media members who regularly cover the NFL. “Drew Brees has planted himself firmly in the MVP race. With 21 touchdown passes and just one interception — one! — Brees is playing some of the finest football of his awe-inspiring 18-year career,” Newsday’s Bob Glauber said. The Kansas City Chiefs received the other two first-place votes and remained at No. 2 with 368 points. The Los Angeles Rams were a close third with 366 points. These two 9-1 teams are scheduled to meet on Monday night in a highly anticipated matchup to close Week 11. The game was originally set to be played in Mexico City, but because of concerns about the playing field at Azteca Stadium after recent rain and several big events, it was moved to the Coliseum in Los Angeles. The Pittsburgh Steelers, who have won five in a row, climbed three spots to No. 4. The Steelers (6-2-1) have surged to the top of the AFC North despite the absence of two-time All-Pro running back Le’Veon Bell. Bell missed a 4 p.m. deadline on Tuesday to sign his one-year franchise tender and is ineligible to play this season. The Los Angeles Chargers moved up a spot to No. 5. The Chargers (7-2), who have quietly won six in a row, have not garnered much attention despite having one of the top records in the league. Instead, the dominance of both the AFC West rival Chiefs and their neighbors in LA, the Rams, has received most of the headlines. “Shaking off a 1-2 start, the Chargers have remained firmly in KC’s rear-view mirror with a well-balanced attack and impactful rookie safety Derwin James,” said Ira Kaufman of Fox 13 in Tampa, Florida. The New England Patriots, who were tied for No. 2 last week, dropped to No. 6 after their 34-10 loss at Tennessee on Sunday. The Titans made a major jump, moving five spots to No. 12. The Patriots (7-3) have a bye this week before facing the New York Jets on Nov. 25. The Minnesota Vikings (5-3-1) moved up a spot to No. 7 during their bye week and return to action on Sunday night at NFC North rival Chicago. The Bears (6-3) rounded out the top 10 for the second consecutive week. The Carolina Panthers (6-3), coming off a 31-point loss to the Steelers, dropped three places to No. 8. The Houston Texans (6-3), who have won six in a row after a 0-3 start, are back after their bye and remain No. 9. The Texans on Sunday face NFC East-leading Washington, which climbed five spots to No. 11.